On November 14, the Department of English hosted “An Evening with Margaret Atwood,” held in the sold-out Bama Theater. This evening was not Atwood’s first time in Tuscaloosa; in 1985, she lived in a house on Riverside Drive while serving as writer-in-residence for the MFA program. According to English Department legend, it was there that she finished The Handmaid’s Tale, a novel that has remained, for three decades, one of her most enduring works. Margaret Atwood is a worldwide bestselling author and is widely respected in literary and academic spheres internationally, holding dozens of honorary degrees. 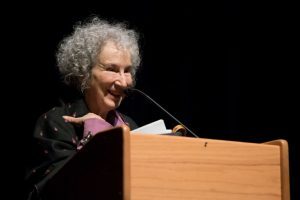 Over the span of Atwood’s 50-year career, she has published over 50 books in multiple genres, including poetry, fiction, non-fiction, criticism, children’s books, and drama. She is also an active writer and activist on Twitter, where she has nearly two million followers. The Handmaid’s Tale is experiencing renewed popularity through its television adaptation on Hulu as well as its unfortunate relevance to contemporary life. The book provides a fascinating connection of past and future, and the ways in which values and ideas can be translated and twisted across generations. Underneath the oppressive and painful situations, however, the main character, Offred, remains a symbol of essential hope for humanity. Offred reminds readers of their individual responsibility to preserve and to protect the values of autonomy and empathy. There are many reasons that Atwood’s work has remained so successful and relevant—her visionary imagination, her committed (and prescient) thinking about the environment, technology, and power—but for me what has been most important is her dedication to portray women as fully dynamic characters: bold, strong, flawed, full of desire, actively pursuing goals, and affecting change in their surroundings. This year, as The University of Alabama celebrates its 125thanniversary of including female students at the Capstone, we are so fortunate, and honored, to have had such a bold, brilliant woman here with us. At the event, she was joined on stage by another writer, Tuscaloosa News Art and Culture columnist Mark Hughes Cobb. The pair discussed Atwood’s history in Alabama, her collaboration with Hulu on the creation of The Handmaid’s Tale television show, and her novels’ relationships to contemporary cultural and political issues. However, the most surprising and entertaining moment may have been hearing Atwood rap one of the scenes from her most recent novel, Hag-Seed, inspired by Shakespeare’s The Tempest. 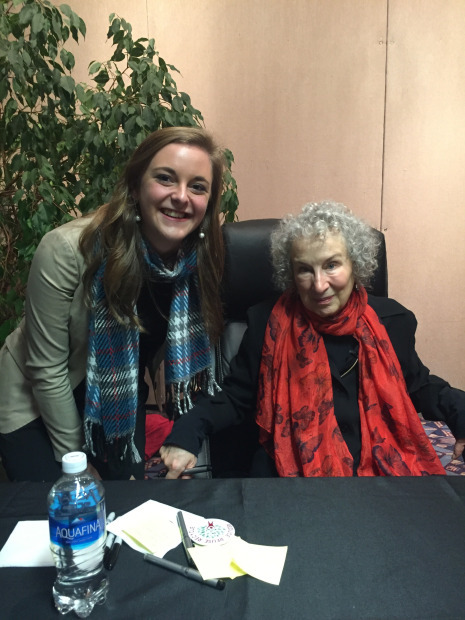 At the end of the night, Atwood remained at the theater to sign books for fans. She was dedicated to signing each and every one, and stayed well into the evening in order to do so. Truly, this was a special opportunity for The University of Alabama’s Department of English, as well as the city of Tuscaloosa. Atwood’s intellect, kindness, and humor have been remarkably inspirational to many citizens here, and we hope to host her again soon.